Arranging good, solid links should be part of your links strategy, especially at the beginning of your link campaign, but not your one and only marketing strategy, though. As I already mentioned, one–way links are something you should never neglect. They bring you respect from Search Engines — as well as traffic. I′ m going to tell you how you get one–way links to your site. You′ ll get to know the best–working ideas and the best practices. Sure it largely depends on how well you perform at this point — though I believe with the guidance you′ re getting and the things you already know, you simply can′ t miss. Are these chapters updated to year 2015 as well ? All the chapters of this book as the seo bible. 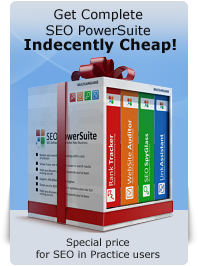 These chapters are the basics of SEO - and they are still valuable even in 2015 if done properly. Dan, thanks for the reply. I have also contact you with contact form with my query. Kindly, look into it. What a great ebook i just finished reading the whole thing and i think im confident to do SEO for my self thanks forhelping other people. This is a great article for quality link building. Thank you for sharing. Thanks for the resource Donna, I'm going to check it out. There must be good portal of link exchangers and webmasters. If you know any related portal Dan, Please let me know. These appear to be directory submission tools. Just like I said in <a href="http://www.seoinpractice.com/directories.html">this chapter</a> directory submissions are a great way to get relevant one-way links. There are a lot of directory submission tools and services out there. Thanks for sharing your favourites with us. I would like to share a couple of links that provide unbelievable help finding high quality one way links for the most part! The first is http://www.onewaytextlink.com/ I have found this resource just too good to pass up! The second is http://www.businessseek.biz/page.php?page=web-submit and they put all the information and url's rigth at your fingertips. Yes Donna I also use this directory. Its great way to link building. I got PR 3 because of this.